I was a little hesitant when I saw that I needed to grab a bone in pork chop. Mostly because I usually wimp out and go for the boneless knowing it will be much easier to cook. I sucked it up and went for the bone. These were some thick chops. I got two, just for Andrew and I, and cut the recipe in thirds. 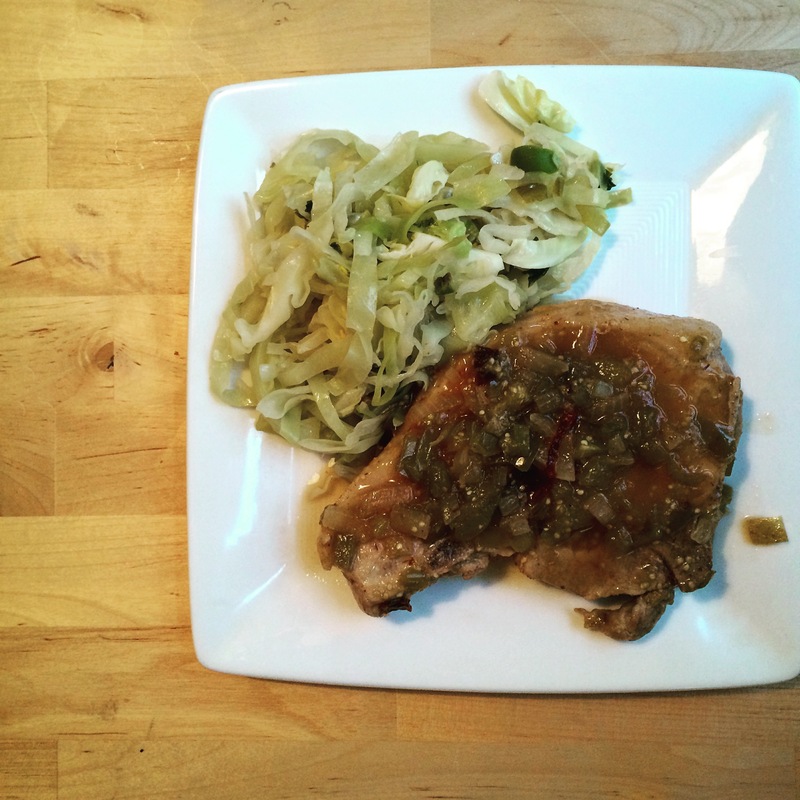 Entomatado, Pork Chops in Green Tomato Sauce. In the back of this cookbook are recipes that Diana Kennedy was either given or found from old Mexican cookbooks. This one was from Libro De Cocina in Toluca. It was published in 1895. How cool is that! Awesome! 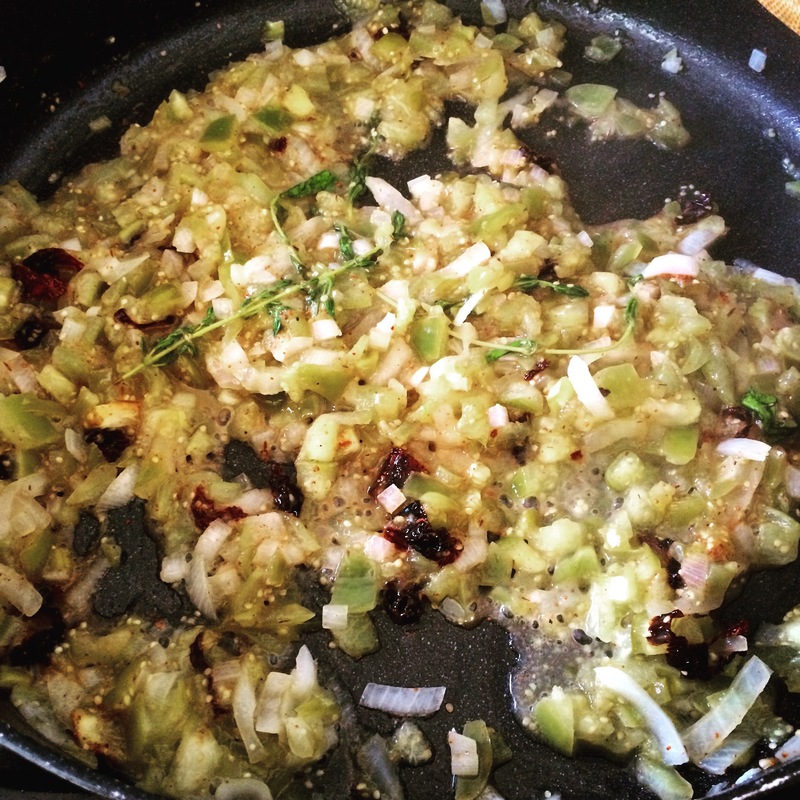 The sauce for the pork chop was made up of tomato verdes, cinnamon, caraway, peppercorn, cloves, marjoram and thyme. The instructions said to add a little brown sugar to this sauce if the tomatoes were very acidic. They definitely were, so in went a pinch of brown sugar. The cooking of the pork chop was the most interesting. First, I had to simmer it in only water over low heat until tender but not done. Then once the sauce was ready I added the pork chop with the pork broth that I had now made and that cooked together on low heat for about 10 minutes. After that I was told to set the dish aside for one hour to let the flavors really marinate. I was sure the pork chop would have been a hockey puck by the end of that, but it was tender and juicy. This was served on a bed of white rice. This salad was so simple and really good. I wouldn’t call it a salad as we would normally call one today. 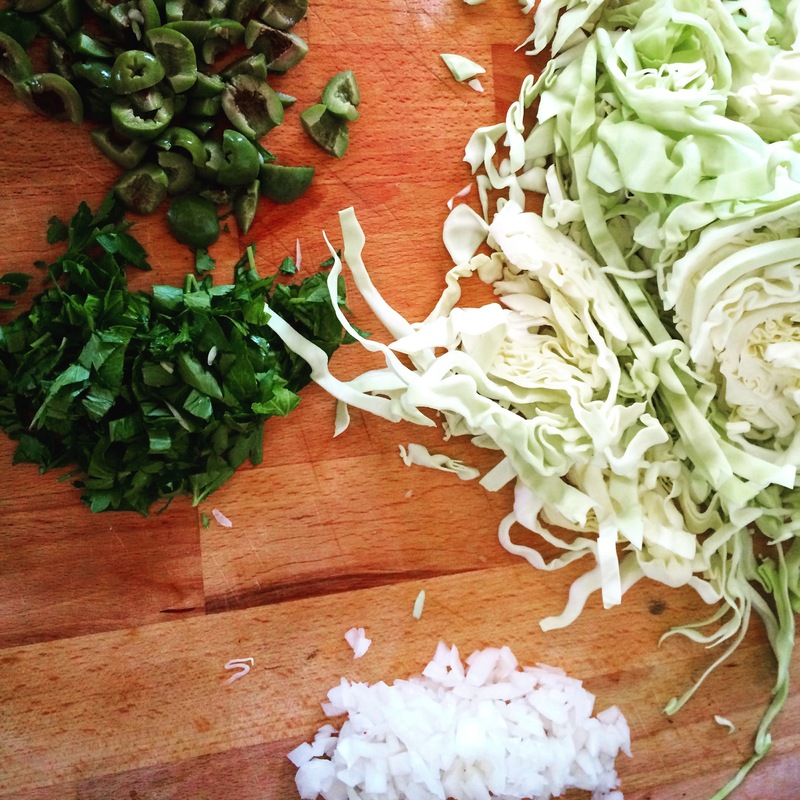 The cabbage is boiled for a minute and left to pickle with onion, parsley, green olives, wine vinegar and jalepeño chiles en escabeche. It then sits, getting more flavorful as an hour passes. While both dishes were from different books, I thought they went together perfectly. A good meal for a dinner party since the original recipe called for 6 pork chops. Yum. The Strangest/Most Delicious Guacamole I’ve Ever Had.